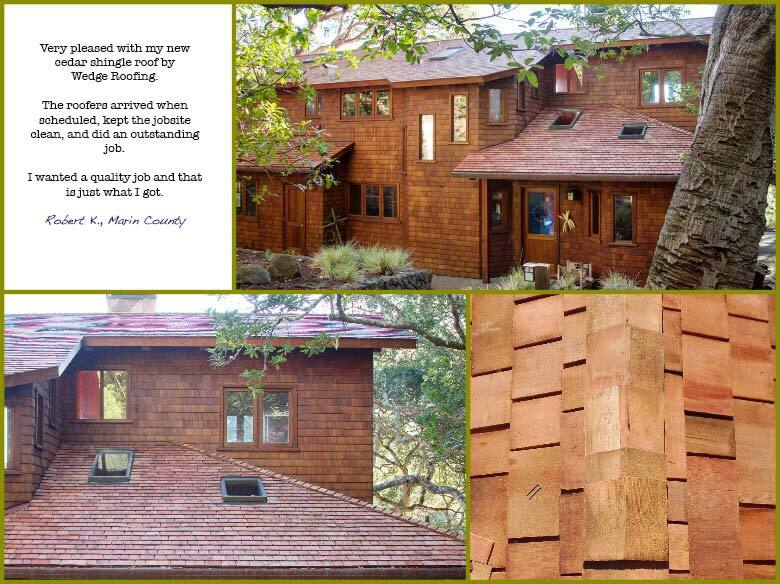 Sourced only through suppliers working directly with the United States Forest Service and Red Cedar Shingle Bureau, Wedge Roofing ensures that all wood shingles and shakes are of the highest quality and ethically sourced. High quality, fire-treated wood shingles are both a durable and recyclable material. Most Building Departments in the San Francisco Bay Area, including Marin County, Sonoma County, Napa Valley, San Francisco and Contra Costa County require fire-retardant-treated Wood Shingles and Wood Shakes on all wood shingle reroofing and new wood shingle roof installations in conjunction with a fire-barrier roof assembly. My husband is a General Contractor and does not like to give referrals but he always refers Wedge Roofing because he knows his clients will be taken care of. In 17 years he has never had a complaint from a client for work that has been done by Wedge Roofing.